So i'm finding the distractions of facebook to be ..well...quite fun...but very distracting. Good thing I'm on break! I have found the best photo's of my past...course none of them have me in them. Funny, I remember hanging out with Allison Futeral at most of these punk rock/Jules events...in fact we got stuck many a time working the door or making the kiddies come inside! but no pictures. 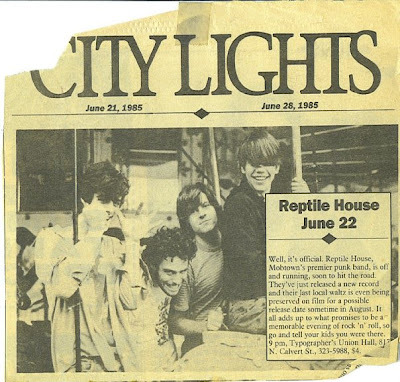 Anyway.....here is one of the original Reptile House....I wanted to post a pic of London May....one of my X's from the past.Wonder where he is these days. did you notice the date? my bday after graduating from Towson State!